has led to greater self-confidence and better quality of life. The procedure of inserting an implant involves attaching an artificial tooth (crown) to an implant anchored in the jawbone. 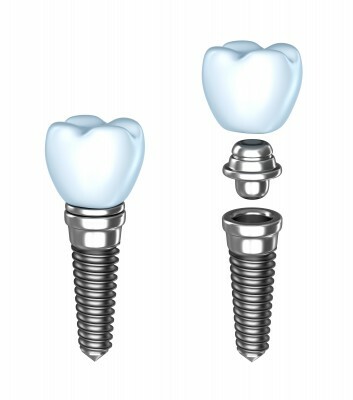 The implant itself is a small titanium post which acts like the root of a normal tooth. Once the implant is placed, your own natural bone and gum grow around the implant, holding it firmly in place. This helps to strengthen the implant and make it more durable over time. There are generally three appointments involved in this procedure. 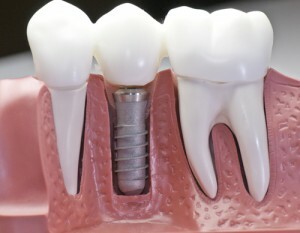 The first is the placement of the implant. Healing is very quick, but integration needs time. The second phase is performed after a 3-6 month period of implant integration within the bone. Once it is determined that the implant is fully integrated and secure in the bone, then we would proceed with the second appointment which involves taking a master impression of the implant. From this impression, the laboratory fabricates a custom-made crown. The third appointment is the final fixation of the crown onto the implant. This completes the third and final phase of the restorative period. All of these are short appointments. Once the implant is placed, all subsequent appointments do not require any anaesthesia. Implant therapy has thus become a painless and exceptionally reliable treatment for replacing missing teeth. Once complete, you will regain a healthy smile, maximal chewing capabilities and the confidence to smile again! Contact us today for more information on dental implants in Kanata, or to schedule an appointment at our dental clinic.